Live Blog: Monday Afternoon, May 21st - Practice Day! Live Blog: Monday Afternoon, May 21st – Practice Day! 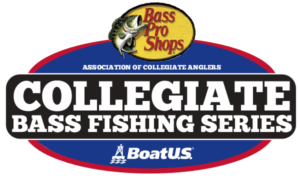 Monday, May 21st 9:00 P.M.
Day 2 of official practice for the BoatUS Collegiate Bass Fishing Championship presented by Cabela’s is in the books. As the day progressed, it appears that more and more anglers are beginning to find some fish. After speaking with several anglers at the ramp today, it sounds as though the ledge bite is on. Fish are positioning on deeper structure as water temps are reported to be around 80 degrees in some areas. Size seems to be the main topic of discussion. Fish in the 2.5 to 4 lb. range are easier to come by. 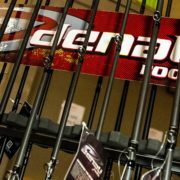 Cracking the code, and catching fish over the 4 lb. mark will be the key to this week’s event. While it may not take a bag full of fish this size to win, the winning team will most likely have multiple fish over 4 lbs each day of competition. This spring, the main storyline on Pickwick Lake was the overwhelming amount of quality size smallmouth being caught. Five fish limits of smallmouth weighing over 20 lbs were not uncommon. So far after two days of official practice, there have not been many reports of smallmouth showing up. It will be interesting to see how big of a factor the smallmouth play come tournament day. This wraps up live blog coverage for today. Thanks for following along and keeping up with the action out on Pickwick Lake. We will be back at it again tomorrow with more updates and insight into what’s going on out on the water. 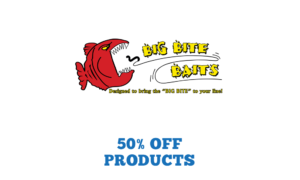 Monday, May 21st 7:00 P.M.
Another presenting sponsor of the afternoon portion of the blog is Big Bite Baits. From the Cane Thumper, to the Finesse Worm, Big Bite Baits has a bait for every situation you may encounter on the water. For information on the incentive program offered by Big Bite Baits, click here. Monday, May 21st 5:00 P.M.
Logan Parks from Auburn University is out on Pickwick Lake for official practice. He is wearing gear from AFTCO, one of the proud sponsors of the Cabela’s Collegiate Bass Fishing Series. AFTCO places an emphasis on conservation, and preserving the resources we enjoy outdoors. This week at the championship, AFTCO is handing out a Bank Bag to each participating boat. The Bank Bag is to be used to pick up trash and debris along the shores of Pickwick Lake. Learn more about this initiative from AFTCO by clicking here. 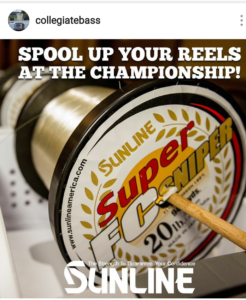 Monday, May 21st 4:00 P.M.
One of the presenting sponsors of this afternoon’s blog is Sunline. 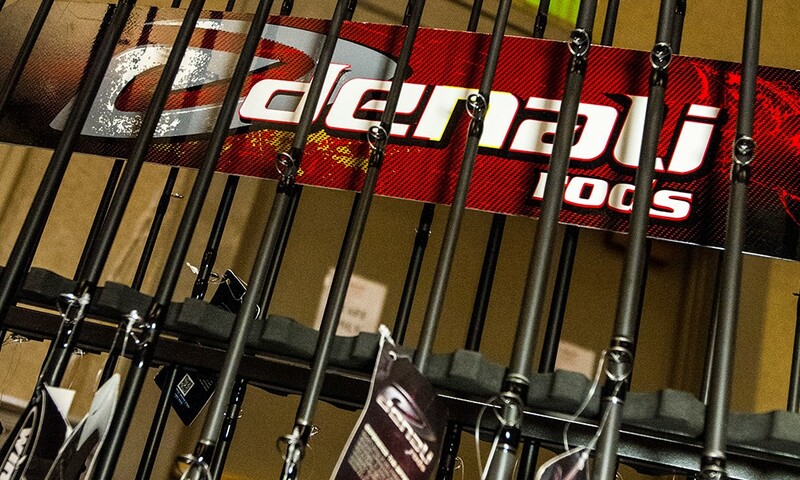 At Wednesday night’s banquet, anglers will be able to spool up one reel with line for free. This is an awesome opportunity to gear up for tournament action! For more information on this partnership with Sunline and discount programs, follow this link. Monday, May 21st 3:40 P.M.
Pictured above is Scott Ellis from the University of Tennessee – Knoxville. Scott caught this beautiful fish on the first official day of practice yesterday. A big bass event was held on Pickwick Lake over the weekend, and it took an 11 lb. fish to win. There are some big fish that live here. It will be interesting to see what size fish come to the scales this week. Monday, May 21st 2:10 P.M.
We are sitting by the launch site here at McFarland Park, and the conditions outside are rather pleasant. Air temperatures are in the low 80’s and a light breeze is blowing creating a slight chop on the water. 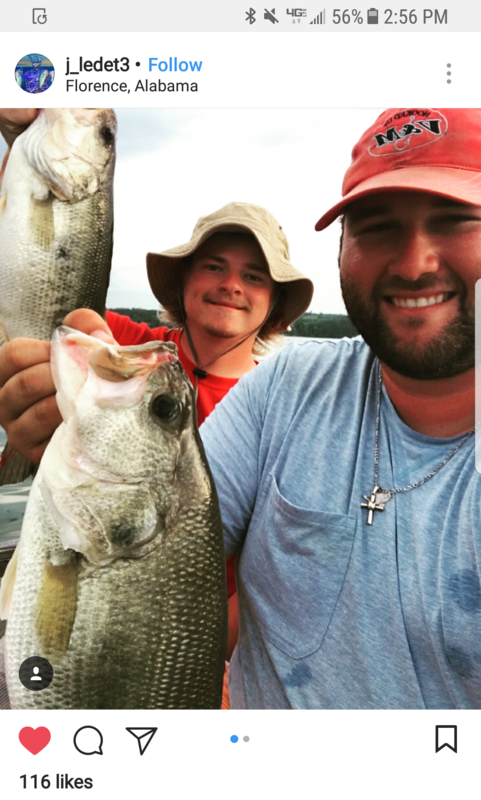 Conditions like we have today should set up well for these anglers to go out and scan Pickwick’s famed offshore ledges for schools of bass. Typically this time of year, the ledges are the main key to victory during this event. As the anglers continue to practice and report back, we will get a better idea of the conditions this week. Monday, May 21st 12:15 P.M.
Preparations are underway here in Florence as we prepare for tournament action beginning on Thursday. 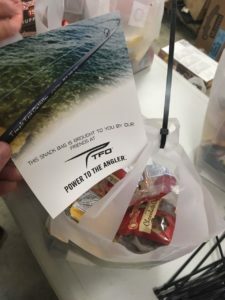 At this year’s championship, all boats will receive a snack bag each day full of food and drinks to have while out on the water. 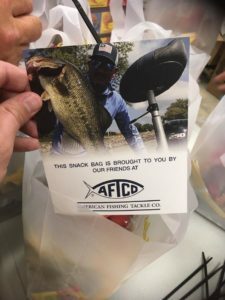 A special thanks to AFTCO and TFO Rods for making these snack bags possible. https://www.collegiatebasschampionship.com/wp-content/uploads/2018/05/Blog-7.jpg 600 1000 Amanda https://www.collegiatebasschampionship.com/wp-content/uploads/2018/11/2019-Bass-Pro-Shops-Collegiate-Bass-Fishing-Series-Association-of-Collegiate-Anglers-Boat-US-2-300x179.png Amanda2018-05-20 21:24:072018-07-06 11:53:28Live Blog: Monday Afternoon, May 21st - Practice Day!